The ability to extend beyond SAP and cover every technology involved in your end-to-end transactions can make the difference between fragmented spurts of automation and a comprehensive, trusted test automation strategy. Tricentis Tosca offers comprehensive support for all the SAP UIs—including SAP WinGUI, SAP NetWeaver, SAP Business Client, SAP Fiori and Fiori 2.0, SAP on Mobile, and SAP S/4HANA. For S/4HANA, Tricentis Tosca supports all current versions (1511, 1610, 1709, and 18xx), as well as all current SAP Fiori interfaces (1.38.x, 1.44.x, 1.52.x)—without requiring any add-ons. 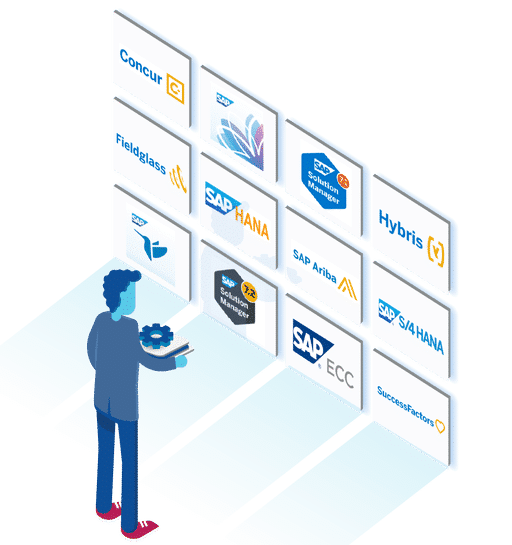 Moreover, many digital enterprises today depend on SAP SuccessFactors for HR and HCM solutions, on SAP Ariba for e-Procurement and Supply Chain solutions, on SAP Hybris for eCommerce solutions, and on SAP Concur for travel and expense management solutions. Having a simple, standardized way to define automation across all of these technologies is essential for efficient and effective end-to-end business process test automation.